Videogames are extremely popular in Japan. Their foremost science museum recently presented a half-year-long exhibit dedicated to the industry's history. A large number of original games were on display. The presence of some of the earliest games addressed the history of both the home videogame and that of the arcade games. At the Tokyo museum, the well-attended exhibit of early videogames closed after a successful 6-month run there. 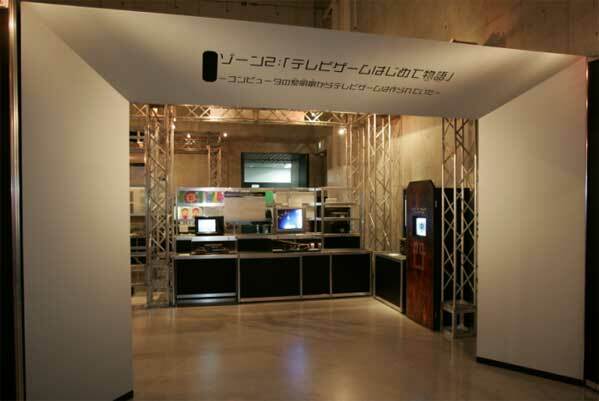 A look at the photo of the entrance to the game exhibit is shown nearby. "The Story of the Beginning of Videogames"
Straight ahead as you enter is the front portion of a display table featuring the "Brown Box", the prototype for the earliest commercial home video game, the 1972 Magnavox "Odyssey" multi-game system. 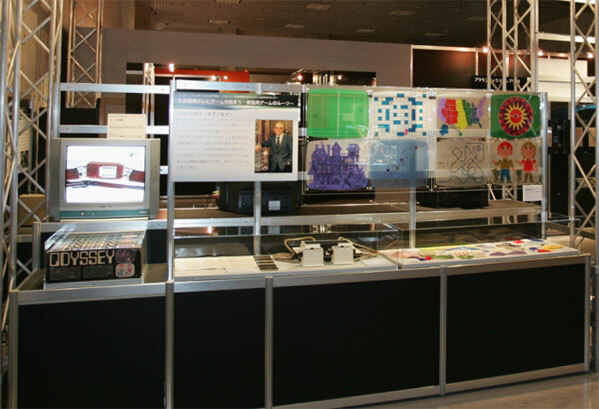 In the photo, the Brown Box can be seen through the Arch on the left side of the display table. As accompanying signs tell the visitor, the Brown Box was the last of seven developmental game systems designed and built by Ralph Baer in 1967-1968. His original concept of playing games on ordinary TV sets and developing the required technology with the help of two engineers made home videogames practical. Resultant patents and know-how were licensed to Magnavox. The Brown Box became the Magnavox Odyssey game system. Which started the home video game industry. It was first sold to the public in 1972. Over 350,000 Odyssey found their way into in US homes within two-and-a-half years, introducing well over a million people to the idea of playing games on a TV screen. The Brown Box played a variety of games as did the Odyssey game system. Among these were Ping-Pong, Handball and Volleyball. It was the Ping-Pong game that most people played and still associate with early videogames, aided and abetted by the popularity of the Nolan Bushnell's Atari Pong game that came into widespread distribution in 1973. In November of 1972, the same year during which the Odyssey introduced people to the idea of home videogames, Atari began delivering the first commercially successful arcade videogame, Pong. An original Pong arcade game displayed to the left of the Brown Box. Pong was wildly successful and put the arcade videogame industry on ther map. Pong games were almost instantly copied by other manufacturers. By the end of 1973 about fifty-thousand Atari, Midway, Seeburg Pong-like arcade machines were sold in the U.S. alone. The Entrance Hall photo above and the picture of the display table shown below also displayed an earlier game system, TV Game #3. It is the small unit at the right side of the display table. TV Game #3 offered a choice of chase games (one player "spot" chasing another and wiping it out on contact) and a light gun target shooting game. 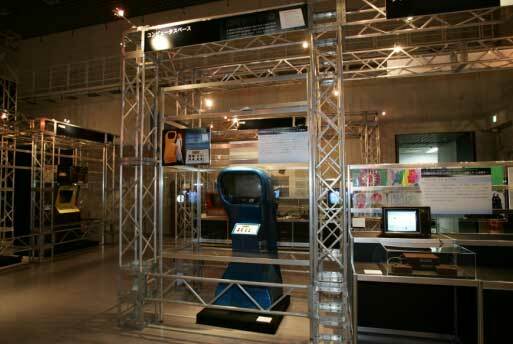 The monitor located on the right of the display table presented a short movie featuring a demonstration of both games systems by Ralph Baer. The large sign at the center describes the genesis of TV Games and of the Brown Box in particular. The monitor above the Brown Box displayed the basic Ping-Pong game that was its central attraction. The rear of the Brown Box display table is shown below. It features an Odyssey and its colorful, transparent screen overlays. The large sign at the rear of this Odyssey display table shows Ralph Baer with an Odyssey game box in 1972. The text briefly details the chronological history of home videogames. 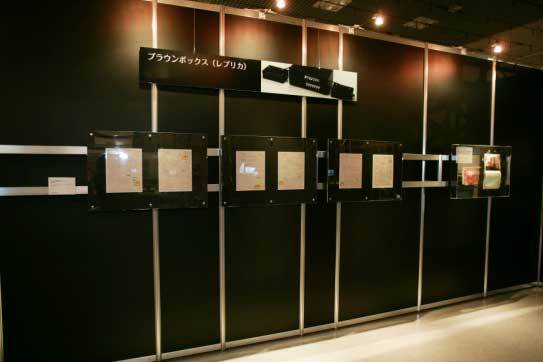 On a nearby wall, the pages from Ralph Baer's original September 1966 Disclosure Documents and a picture of the Brown Box were displayed. 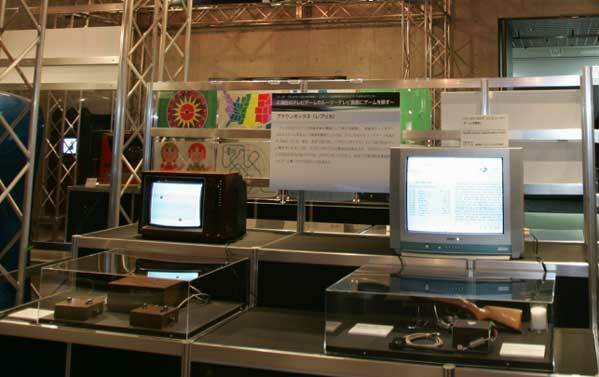 The sign above the row of documents says: "Ralph Baer's Brown Box"
The Tokyo exhibit at their National Science Museum presented a brief but accurate snapshot of the beginnings of the videogame industry. Anyone really interested in the history of home videogames and the details of Ralph Baer's part in that saga can get much insight from his website at <www.ralphbaer.com> and reading "The Story of how Videogames invaded the Home TV set" or by reading his book, "Videogames: In the Beginning".